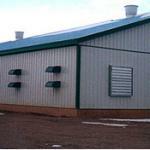 This total system package for 20,000 birds was recently completed by Mackay Equipment. 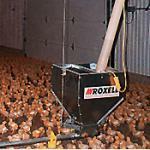 The feeding system begins with Roxell bulk bins. One of the key features here is the feed weighing system. It blends feed components accurately and then delivers the feed to a Roxell Minimax feeding system. The feed and climate parameters are controlled with SKOV production controls. 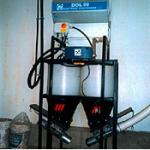 Finally, the feed is delivered to the birds through Minimax feed lines. Roxell pans and drinkers provide water. 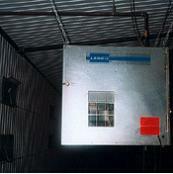 Heating in this barn is provided by LB White heaters which are controlled by SKOV climate computers. 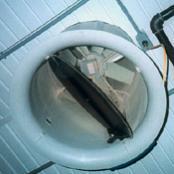 A double row inlet system facilitates summer and winter ventilation. It ensures good climate control through our extreme prairie conditions. Gable end fans provide increased ventilation during extreme summer temperatures. Efficiently designed inlets and outlets offer lower running costs.